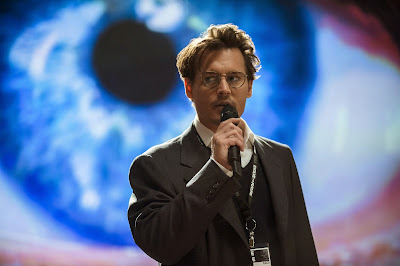 Johnny Depp plays Dr. Will Caster, a scientist on track to develop the most advanced artificial intelligence yet that, as he puts it, would eventually possess more knowledge than the sum of all the people who have EVER populated the earth. This doesn't bode well for a group of technophobe terrorists led by Bree (Kate Mara). They try to assassinate Caster, who survives, only to find that the bullet was laced with a radioactive isotope and he's going to die in 5 weeks anyway. 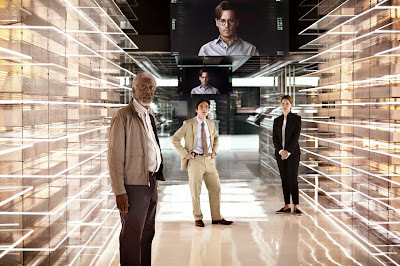 That's just enough time for him to find a way to upload his consciousness into the still in progress AI with the help of his wife Evelyn (Rebecca Hall) and their more ethical pal Max (Paul Bettany). Do I need to tell you what happens then? Probably not because Transcendence is your basic rehash of every mad scientist movie you've ever seen. Caster wants to change the world. Evelyn gets caught up in his dream and fails to see the slippery slope his methods are leading them down. A government-employed mentor (Morgan Freeman) calls in the cavalry to stop him, and only Max is torn between all sides enough to try to stop Will and Evelyn without opting to annihilate them altogether. In the meantime, elements of Brainstorm, D.O.A., The Lawnmower Man, and The Stepford Wives all make their way into the film. Transcendence is a mess. What makes this more disappointing is that its the directorial debut of Christopher Nolan's cinematographer, Wally Pfister. Absent from Transcendence are any memorable visual ideas that would allow the movie to, pardon the pun, transcend its schlocky underpinnings. Instead, Pfister cribs from even more sci-fi classics like 2001: A Space Odyssey and Contact, giving the entire film a bloodless familiarity. Robbing the film of any suspense are the outcomes of Frankenstein, that pesky Star Trek episode, and just about any one of the other films I mentioned above. We all know the mad scientist will have to pay. His enablers will be punished in some way, and his friend/conscience will likely be leading the charge. Dullsville. About the only silver lining of interest here is the fact that Pfister and his mentor Nolan are both technophobes themselves, advocating for the dying art of photochemical moviemaking and strongly opposed to its inevitable replacement by digital methods. In fact, the movie was shot and transferred the tried and true way, with only a minimum of digital tools used for its visual effects. If Transcendence is the best argument Pfister can muster, then it's a losing one both photographically and metaphorically. I had a feeling this was not going to be good. Especially after seeing no advanced screenings or early reviews -- the true sign of a studio afraid to show off what they have. Lazy review. Anyone can take a new movie and reference past films crying "been there, done (seen) that". Does this film make you think, especially after Caster's consciousness is uploaded? What about the acting - not a mention. Again, lazy review . . . If you've read my reviews before then you know I generally discuss acting or how thought-provoking a film is only when the topics are worthy of discussion. Both failed to make any impression in TRANSCENDENCE, mostly because they were overshadowed by its muddle of unoriginal concepts.